Recommended VPN: Get the best VPN for Japanese Netflix, NordVPN. In this guide we’re going to show you how you can watch Japanese Netflix in the UK and all it takes is 5 simple steps. Japanese Netflix has some of the most interesting Netflix content in the world. Unfortunately, most of this isn’t available on UK Netflix, nor any of the other major Netflix websites such as US Netflix. You see, even though you wouldn’t think it, different countries get access to different shows and movies. The great thing is with your UK Netflix account you can login to the Japanese Netflix site but you’ll also need an app called a VPN to allow you to do this and below we’ll explain how in just 5 simple steps. When you visit the Netflix website you’re pushed to the UK site. Even if you try to visit the Japanese Netflix website. To access Netflix Japan from the UK you’ll need to get yourself an app called a VPN. A VPN is available for Android and iOS phones and tablets and also traditional computers and laptops running Windows or MacOS. You can even get them for the Amazon Fire TV devices too! Unfortunately, most VPN services don’t work with Japanese Netflix but two we discover do are NordVPN and StrongVPN. Just follow the 5 simple steps below which will allow you to watch Japanese Netflix in the UK or anywhere else in the world. Follow the links and sign-up to the service. Once signed up go to VPN Apps section of the website and download the correct app for your device. Once the app is installed, run it and login with your username and password. Select Japan on the world map and click to Connect. 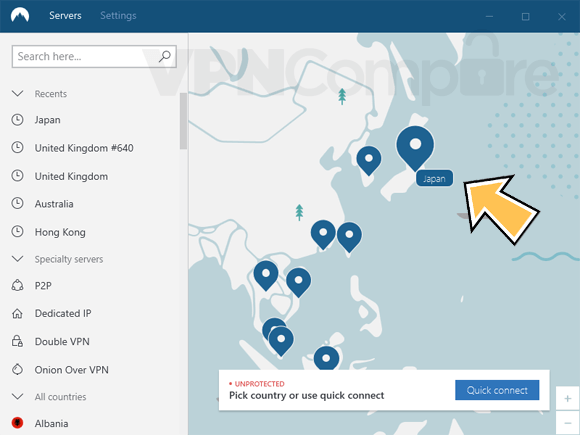 Connect to Japan on NordVPN. The app will start connection to Japan which will take less than 30 seconds. Once it’s connected it will let you know. All you need to do now is visit the Netflix website. You will notice in the address bar you’re now taken to the Japanese version of the Netflix site. All you need to do now is login as normal. You’ll now have access to the entire Japanese Netflix catalogue which includes exclusive Japanese shows, movies, anime and more. When you finished watching just press Disconnect on the NordVPN app and your internet connection returns to normal. VPN services such as those offered by NrodVPN are monthly subscription services. When you’ve signed up you can connect and reconnect as many times as you want as long as you have an active subscription with NordVPN. You can also install their app on multiple devices so it’s fine to use on your phone, tablet and regular computer. NordVPN allow you to use the service on 6 devices at the same time which means more than one person in your family can watch Japanese Netflix in the UK just with the one VPN package. If you’ve done a bit of research then you’ll know “free VPN” services exist. There are multiple security issues with “free VPNs” that you can read about here and here. Security implications aside, the simple fact is, they just don’t work for watching Japanese Netflix in the UK. You may also be wondering why you can’t just one of the many other paid-for VPN providers such as IPVanish, CyberGhost VPN or VyprVPN that also offer Japan connection points. The reason being is even though you can connect to Japan, they’re blocked from accessing Japanese Netflix. Most will just push you to the US Netflix website and even if you do manage to login you’ll be blocked because they know you’re using a VPN. Every internet connection is given something called an IP Address. An IP Address is similar to a phone number in that it tells the internet who requested what and where to send all the bits of data. Like a traditional phone number area code, an IP Address also gives away your location. It doesn’t show your exact location but it will show your approximate area. It does however show what country you’re in and this is how Netflix determines which local version of the site to allow you to use. A VPN works by changing your IP Address to one from another country. When you connect to Japan on the NordVPN app it gives you a Japanese IP Address. When you visit Netflix while connected to the VPN it thinks you’re in Japan and so allows you to access Netflix Japan in the UK. All you need to watch Japan Netflix in the UK is a VPN service. You can sign up for NordVPN using the link below. You should then download their app for your device, select Japan and press Connect. All you need to do then is visit the Netflix website where you’ll be able to stream all the Japanese Netflix content.